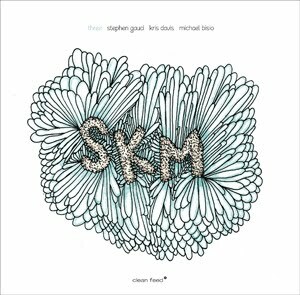 In the past years, I praised saxophonist Stephen Gauci's to the stars, I praised pianist Kris Davis for her innovative musical creativity, and I praised bassist Michael Bisio for his inventive and emotional playing. Then you get them as a trio, and it's a guarantee that sparks will fly. The playing is unconventional, so is the structure of the compositions, and so are the order of the pieces, starting with "The End Must Always Come", with an intro of heads-on heavy piano chords and a frantic right hand, with Bisio's bass trying to keep up with Davis's stream of consciousness. Gauci joins with short staccato bursts, then starting with wild phrases with the piano circling around the same tonal center, increasing the wild intensity, yet gradually the piano limits itself to repetitive phrasing over a single note by the bass, and beautiful soloing by the sax, full of resignation for the inevitable, giving up all struggle, leaving the floor to the polyrhythmic repetitive piano.In short, a kind of strangely evolving piece, yet full of depth, introducing the listener into a real wonderland. "Like A Dream, A Phantom" starts with solo sax, with a piano response in an almost post-boppish way - I almost expected Davis to start grunting along like Jarrett - then shifting from slow romanticism to more intensity, with Gauci organically joining in with repetitions of the same note, the piano dropping away, and Gauci's heartrending playing tenderly supported by the warmth of the bass, mirroring the growth of intensity by the piano earlier in the piece. The most expressive piece is without a doubt "Something From Nothing", with the piano, sax and bass playing muted percussive sounds, like a mad and relentless rhythm section, with the occasional voiced note arising out of the agitation, now a piano key, then a single sax tone, or a string plucked. The piece's magnificent restraint creates an equal level of tension, that is gradually, ever so slowly released, not in a tune, but in a rhythmic playing with the same notes, around which the three instruments start adding tiny expansions, maintaining all the while the relentless tempo they set from the start. I will not review each track. You get the picture: each piece is carefully and inventively structured, capturing the soul of music, turning the familiar upside-down without changing it completely, offering new perspectives on interaction, making the unexpected essential in each piece, treating the listener to fantastic ear-candy and to some fun too: on "Groovin' For The Hell Of It", a quite free development suddenly hits the wall of a halted piano rhythm, going totally against the established groove, sounding like the sax is taken by surprise, but smoothing things out as they proceed. The same playfulness in the interaction can also be heard on the last track. And despite all the wide explorations of the possibilities of the instruments, it stays relatively accessible, even Bisio's fantastic "Now", a bass solo beyond the conventional, with a few piano strings plucked in the middle part. The album's highlight is "No Reason To Or Not To", a slow minimalist yet wonderfully lyrical piece, on which the trio sets down a mood and atmosphere with sparse sounds, not built around solos, but around a few cautious phrases. An absolute delight, this album. You can keep listening to it: joy and new pleasures are guaranteed with each listen. Without a doubt, these three musicians understand music in a very profound way and manage to create music that is also utterly creative and deep. Don't miss it.